I was never a Boy Scout growing up. Nor was I the “outdoorsy” type who loved exploring the wilderness, sleeping in bug-infested tents or cabins with small forest creatures lurking about, or starting fires without matches and tying all sorts of knots. In fact, my idea of “roughing it” would be to stay a night in a Motel 6. Since my son has become involved in Cub Scouts, however, and I a Den Leader (not necessarily by choice), I have learned that there are a lot of valuable life lessons that can be learned. Many of these lessons can be applied to the business realm as well, particularly when it comes to building a brand image. 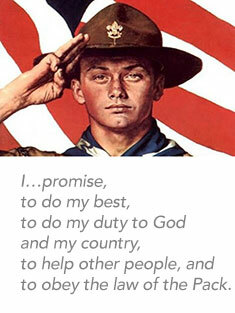 Take the Scout Motto, for instance. Recited before every Pack or Den Meeting, it is a perfect example of a Mission Statement. And it can also easily be applied to successful businesses or brands. If you still have a hard time making the connection between Scouting and business, let’s dissect the motto line by line.